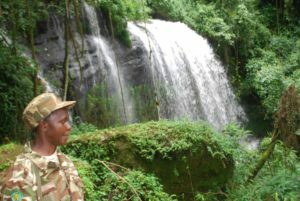 A female warden at Mt Elgon national park’s Chebonet falls along the wild nature walk. Photo by Daudi Nana. KAPCHORWA— If you have never gone for a wild mountain trail, you will not see the value and you will always decline when asked. But a group of researchers/ psychologists from Stanford University found out that wild environments boost well-being by reducing obsessive, negative thoughts. And recommend that it is a healthy physical exercise that creates wonderful memories and provides opportunity to slow down and disconnect. “A walk in nature brings us serenity by allowing our overstimulated modern minds a chance to rest, it helps us to relax, it lowers our stress, depression, and anxiety levels, it increases our attention spans and memory, and it provides a source of gentle exercise,” says Dr Muhammad Mulongo, the Bulambuli District Health Officer. Dr Mulongo recommends further that given the chance, nature walks and hiking teaches us important truths about life. And if this is true, getting outside and experiencing nature in itself is a wonderful activity but you can take this experience to another level by turning it into an active experience. The Mt Elgon national park tourism warden Mr Peter Mbwembe says if you are looking to get a feel of nature, but you don’t want to get so far from the touch of animals, Mt Elgon offers short nature walks of about 5Km to 25Km, away from the busy park to enjoy a quiet walk in this vast hilly mountain. At Mt Elgon, hikers will choose from four well-trodden ascent routes, which start at the Kapkwai Exploration centre in Sipi, Kapchorwa district at the slopes of Mt Elgon and again all converge towards the Kapkwai centre. Mr Mbwembwe says the longer trail route takes you to Tutum cave which is about 25Km away up Mt Elgon which is the longest and steepest route but popular. He explains that the other steeper route, the 7km trail to Kapkwai cave through Chebonet falls, draws most climbers but offers limited potential for crucial altitude acclimatisation and could take you close to the bamboo zone. Mr Mbwembwe said the other route is 5km; the Chebonet trail through Cheptui Falls around the exploration centre to view points through the thick forest; a three hours walk through the Mt Elgon mountain forest. “Three hours ascending the southern face of the mountain before descending to the Mt Elgon exploration centre,” adds Mr Mbwembwe. He explains that the last route is the bridge view route, a shorter guided walk of around two hours which can be taken through Chebonet falls extending to over 2km radius from Kapkwai exploration centre. He adds that from the Kapckwai exploration center, the trails will lead travelers to the thick shrub along the loop trails which stretches to cover Cheptui Falls, Chebonet falls, traditional caves and small rivers that flow from Mt Elgon. The Mt Elgon park guide Mr Paul Ngorok who takes us on a tour guide says the park, nature walk is blended with thick forgotten medicinal trees that occasionally bend to allow wind pass by. “This place is very quiet and scary but sometimes quietness is the best noise. And I love the stillness and calm of an empty trail because it reminds me how much I love hearing no noise at all but for those who love birding, it is an experience of learning how birds sing in the nature provided by God,” says Mr Ngorok. Ngorok who guided us through the local footpaths used by early man to access farm fields, forests, and to cross from one ridge to another, says you discover a part of Bugisu sub-region few tourists ever see. “And do you know that there is a talking tree in this forest? It talks and besides the songs from birds here, a tourist will also listen to the talking tree,” Ngorok said. He explained that Mt Elgon is a 4,321m extinct volcano, which in pre-historically stood taller than Kilimanjaro does today and that it first erupted 24 million years ago. He said spectacular scenery is the main attraction for hikers on this undemanding mountain with a variety of forest monkeys, small antelope, elephants, buffalo and about 298 bird species not recorded elsewhere in Uganda. He explained that many a journalist loves coming to Mt Elgon national park and relaxing and watching the sunset!, watching some of the birds not seen anywhere in Africa! This is a great area to bring the kids and unwind! The Mt Elgon nature walks at Kapkwai exploration centre will bring you in touch with the beauty at Mt Elgon, depending on the time the hike starts. Ngorok says that a multi-day adventure walks take you along the lower slopes of Mount Elgon, on ancient trails between the national park forest and local villages at 1400-2000 meters. Ngorok points out that as you walk you will be amazed by the beauty of the surrounding landscape, from Kapkwai – to the encircling mountain rainforest, the waterfalls and rivers lining the valleys, farm plots full of coffee and banana trees, pastures, wildflowers, and the magnificent views of the sweeping plains below. The routes pass through the land of the Sabiny and Bagisu people, who for centuries have cultivated this fertile mountain paradise. A visitor at Mt Elgon national park could also wander along the splendid water-falls banks. hiking to the splendid Sipi Falls which are in a series of 3 cascading falls. ” You will relax with pleasure at the foot of the falls found at the rim of Mt. Elgon and also visit some of the mountain caves before proceeding through various plantations and dine and slumber at Casa Sipi lodge,” adds Mr Ngorok. Ngorok said the main idea is to capture the imagination and creativity of tourists by giving them a particular pursuit when involved in a nature walk. “They do this by creating some kind of a guide or collection in whatever interests them. They get to make their own guide, booklet, or collection from their discoveries,” Ngorok says. Swalley Naminyi, the executive director at Casa Uganda Safaris, a tourist travel company says the nature walks pleasantly shock many when they discover that they have opened up a whole new world to a tourist and that they will often continue with their new found pursuit long after the initial nature walk is over. “These nature walks in Mt Elgon bring a lot of fun and discovery into one’s life; the spectacular landscapes and great bird species, with sprawling forest and soaring mountains, make Mt Elgon Park the most picturesque park in Africa,” Naminyi says. Uganda Wildlife Authority annual report for 2016 says Mt Elgon slopes favors the growth of rich different types of vegetation’s ranging from montane forest to high open moorland vegetation characterized with the rare species of groundsel plants and giant lobelia life. It adds that the vegetation depends on the altitude and the different vegetation zones have acted as habitat to different bird species. Mr Naminyi explains that the botanical diversity of the park avails the tourists with an opportunity to enjoy activities such as the tree species identification and among the recommendable plant life include the giant podocarpus found in only high altitude areas, the species of juniper and Elgon olive trees cedar which are only found in mountain Elgon, Juniperus procera and pillar wood Cassipourea malosana as well as elder Sambucus adnata, and various orchids. He adds that of the total species of 400 tree species recorded for the area the following are of particular note as they only occur in high altitude broad-leaf montane forest and Ardisiandra. Ngorok says Mt Elgon national park has a very impressive bird list of over 298 species, the second-highest population of any Ugandan reserve, following only Queen Elizabeth National Park. “And the only way you can watch birds is to go nature walk. So visitors can easily see more species out there and with more than 100 species recorded, Mt Elgon is especially good for spotting raptors. Migratory birds are present from November to April,” Ngorok said. 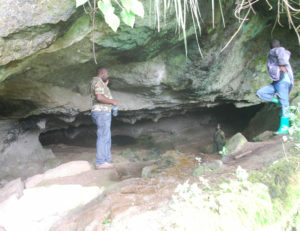 One of the traditional caves at Mt Elgon national park. Photo by Daudi Nana. The Chief Warden Mt Elgon Conservation area Mr Fred Kizza says Mt Elgon nature walks enable the bird lover traveler to enjoy the views and sights of birds including the 40 restricted bird species that includes Alpine Chat, Moorland Francolin as well as Moustached Green and Tinkerbird. Kizza explains that the existence of different bird species gives Mt Elgon nature trails unique bird spotting points. He explained that other attractions found in the park include ancient cave paintings close to the trailhead at Budadiri, spectacular caves and hot springs within the crater, as well as the famous Imbalu dances and ceremonies held by the local people during manhood initiation ceremonies. He revealed that the Mountain is a home of big caves, some of which are ancestral like the Kintu cave, Khaukha, the Tutum cave [believed to connect a Kenyan cave called Kitum (in Mt.Elgon Kenya), Kapkwai caves, Kifundi, Mude cave, Hunters, Chesikak, Kapsokona and Ashawa caves. Income to the Park received yearly from Foreign tourists?